I have a milestone in a plan and want it to reflect the earliest of it's predecessors rather than its last. Any idea how i can do this with P6? you can make the Act. "Site started on" a Level of Effort Activity and link all Site Act. with SS. Create the a new bar for the Act. "Site started on". Santosh you are bascially doing the same thing that I have suggested. You stil have to assign a code once you determine which ones drive to be able to filter for those. It is not clear if the question means milestone after the start of the predecessor that started earliest or milestone after the finish of the predecessor that finished earliest. The challenge gets more interesting if it means milestone after the finish of predecessor that finished earliest. In the following scenario the predecessor that started earliest and the predecessor that finished earliest are different activities. It gets more interesting if the challenge is for milestone after start/finish of more than one activities starts/finishes. Good model shall allow for successors to milestones to work as expected in any scenario. Easy if using consumable resources. There is a much simpler answer, that you can add the Relationship Free Float and Relationship Total Float columns into your PRedecessor window and then determine which relationship will drive.. Try this if nothing else works, you really need this functionality, and the site work activities are on their own WBS node or can be put on their own WBS node. 1. Create a WBS Summary activity for the site WBS work node. 2. Tie the milestone to the WBS Summary activity with a SS relationship. Raymund's suggestion seems like the best approach if the milestone exists solely to report the start of the collection of activities - i.e. for outputting a date on a table and/or bar chart. Thom's initial question seemed to imply something different. In any case, an attempt to flow schedule logic through a milestone constructed this way will have unintended consequences, as Rafael has pointed out. The Purpose of the Subject ALAP milestone is to reflect the Earliest of the Group as required by Mr. Thom rather than Driving, Trailing or Leading a group of Activities. As per my prior posting. Be aware that the option to use an ALAP milestone as a predecessor to the activities is not a solution as it might be moved out of location if a successor to the milestone is added, a common suggestion by novice users. So much effort for a milestone that add nothing to the schedule makes no sense, usually the need is for the milestone to drive other activities down the road. If you add a successor to the milestone as to drive some other activity that other activity in some/many cases will move the milestone to the left. Create a Milestone, Assign the different activities as Succesors. Set a Constraint for the Milestone as As Late as Possible. The Milestone will always follow the First Activity. Cheers Zoltan, I shall give that a go. 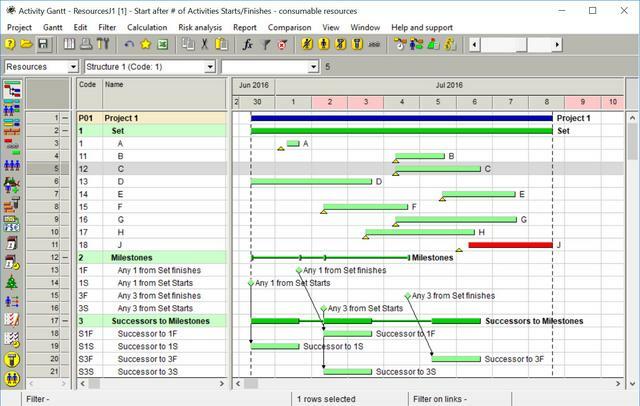 In the following video you will see a model of your scenario where site activities are independent of each other and a successor activity is driven by the start of the earliest activity start. I want the headline activity to show when the first of those has started not the last. Easy if using consumable resources leveling. Most mainstream software are stuck in the 1960's CPM functionality, few can deal with complex modeling of consumable resources. In the following example the potential predecessor activities produce the consumable resources either at start/finish profile as required and the milestones start when enough consumable resources are created. Novice schedulers do not understand consumable resources, novice schedulers do not understand spatial resources. Let's say you have a finish milestone with 5 FF predecessors, and you want the milestone to be scheduled (i.e. early finish) as soon as the first of the 5 FF predecessors finishes. This is a common request among novice schedulers, but it's simply not possible (nor typically desirable) in P6, nor in any of the other mainstream project scheduling tools. The way logic-driven scheduling works, ALL predecessors must be satisfied before an activity is scheduled. Scheduling when ANY predecessors are satisfied - i.e. what you are looking for - would require some pretty major programming changes, and there's simply not a demand for it. Experienced schedulers make the tool work just fine as it is.